Emory Healthcare is the first hospital system in North Georgia to offer patients access to a new spinal cord stimulator to help relieve chronic pain. The FDA-approved device, known as the Intellis System, is the world's smallest implantable spinal cord neurostimulator. The first Emory device was successfully implanted at Emory Johns Creek Hospital in October and is also currently being used by Emory University Hospital, Emory University Hospital Midtown and Emory Orthopaedics & Spine Center. "This technology can play a major role in getting patients off opiates and other pain medications which is a big focus in the medical community and in society today," says Gerald Rodts, MD, chief of the Division of Spine Surgery in the Department of Neurosurgery at Emory School of Medicine. The device consists of two components, including an electrode placed in the middle of the back through a small incision or needle which is in contact with the lining of the spinal cord. The second piece is a thin, light-weight battery positioned under the skin in the lower back. It delivers mild electrical impulses to the spinal cord, to interrupt pain signals that travel between a patient's spinal cord and brain. The Intellis platform is equipped with a tablet using wireless programming and a neurostimulator that can track patient activity around the clock to follow their progress. The system charges the device's battery faster, in just 45 minutes compared to older neurostimulators that take several hours. It also boasts improved battery performance and offers MRI technology that allows MRI scans anywhere on the body, under certain conditions. To contact Emory for more information or for an appointment, please call 404-778-7777 or 800-753-6679 and speak with one of our HealthConnections registered nurses or representatives. 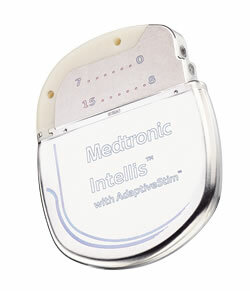 For more information about the device visit, Medtronic, Inc.
Emory Healthcare, with more than 16,000 employees, is the most comprehensive health system in Georgia. Emory Healthcare has $3 billion in annual net revenue and provides $72.3 million in charity care. System-wide, it has 1,976 licensed patient beds. Emory Healthcare is the only health system in Georgia with three Magnet-designated hospitals, Emory Saint Joseph's Hospital, Emory University Hospital and Emory University Orthopaedics & Spine Hospital, for nursing excellence. Emory Healthcare's core purpose: "To serve humanity by improving health through integration of education, discovery and health care." For more information, visit www.emoryhealthcare.org. The Emory Orthopaedics & Spine Center, one of the largest academic and integrated outpatient spine and orthopaedics centers, has 24 physicians across nine locations specializing in orthopaedic spine surgery, neurological spine surgery, physical medicine & rehabilitation, and occupational medicine. Evaluations before surgery/procedures and follow-up care after surgery/procedures are conducted at these outpatient centers located throughout metro Atlanta.